A strange year for “The World’s Greatest Comic Magazine” as not only was it more in the public eye because of the upcoming 20th Century Fox movie, but it was now just one of four FF titles, and not even the best selling. 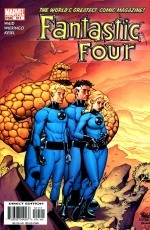 A child-orientated repackaging of early adventures was granted in Marvel Age Fantastic Four, while it finally got the honoured Ultimate treatment at the end of December 2003. Ultimate was outstripping the regular title by over 2 to 1 throughout the year, its average issue sales of 49,571 somewhat short of Ultimate’s 99,929. (For the record, then the other two debuting titles - Knights 4 and Marvel Age Fantastic Four - sold an average of 44,114 and 13,099. However, the normal FF’s figures were fairly constant, with the blown-up launch figures of Ultimate losing nearly 49,000 from the January issue to December’s, and Knights losing over 28,700 over ten issues. Marvel Age did the worst, rapidly haemorrhaging readers every single issue, with over 73% of its original audience deserting it by the time it came to the two December issues. Oh, and if you really want to know, the mini-series Hulk vs. Thing shifted a fairly respectable average of 36,760 per issue, even though that too saw a drop-off of an average 4,433 readers per month). Ultimate was cancelled in 2009 after 60 issues, Knights ended in 2006 after 30, and Marvel Age became Marvel Adventures: Fantastic Four, which ran for 49 issues and ended in 2009. There is the sense that after Waid’s high point of “Authoritative Action” concluded, then he could never again reach such highs. The follow-up story featured the FF accused of treason, with their assets frozen and Nike and Microsoft not only withdrawing their sponsorship deals, but suing the FF for tarnishing their image. (Which does add some justification for Ben’s later behaviour in #527). Although “Hereafter” has charm, with the group meeting Jack Kirby in the afterlife as the Creator, it’s essentially a big reset button which is dramatically unsatisfying. Not only is Ben expectedly brought back to life, but Reed gets his face restored (not that I’m suggesting the scars should have remained, but they could have been reversed in less of a flip manner) and, worst of all, the FF are given a photograph of themselves as contented elderly citizens. A nice gesture, but logically it removes any sense of danger from any story that may follow. The story charms for its first two instalments, but with the increasing focus on Johnny’s pop culture referencing and post-modernism, coupled with the appallingly overwritten and trite sentimentalising, it’s one of the weakest developments in the run. A lot of this perception could be a cultural thing. As a fan of the Fantastic Four born and raised in England, it’s a country where earnest expression of emotion, and unashamedly sentimental platitudes aren’t widely indulged in. From this point on there was also a notable drop in discipline from Wieringo, with his characters suddenly possessing elongated torsos and shorter legs. It betrayed a certain amount of sloppiness that wasn’t there before, most obviously towards the end of the run when Waid experimented with Marvel plot for the first time on the book. After Ben had been brought back to life, the book featured five issues of the Frightful Four. To be accurate, the first two were a throwaway but diverting Torch/Spider-Man team-up where they accidentally encounter Hydro-Man, and in the shadows we see the Wizard plotting to upgrade Hydro’s power. While an amusing enough story, the idea of trying to glean humour from Johnny being naked while surrounded by small children is ill-conceived at best; Waid even had a lawyer-troubling Michael Jackson line in the issue. Both issues contained back-up stories with Reed, Sue and Alyssa Moy, lasting for four/six pages and illustrated by Paul Smith. The actual Frightful Four story itself attempted to reinvigorate the characters, with the Trapster a bald, muscular guy that gets sentenced to a living death in a time loop of the Wizard’s devising. 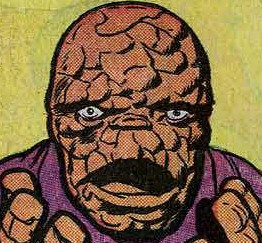 A new member, a shape-changer known as Salamandra is introduced, just one of only 30% of the total members to have actually have been introduced in the Fantastic Four’s own title itself. (The others being Medusa, Thundra, Klaw, the Red Ghost and the Punisher… okay, 33% if you wish to count Dragon Man). None of the three core members of the group – Wizard, Sandman or Trapster/Paste Pot Pete – were created specifically for the title. (See the entry on 1965 for further details). Rejoining the quartet was Hydro-Man after his 1989 teaming, with the Wizard having heightened his powers but also his control. A new, empowered group with a more sadistic and credible Wizard was a nice idea, though sadly undermined by Paco Medina’s guest artistry, which managed to be even more cartoonish than Mike Wieringo’s. With bulbous, unnaturalistic noses and oversized feet, it was something of a downturn, especially when coupled with the fact that Johnny was infatuated with the Wizard’s previously unhither-to mentioned 19-year-old daughter, Cole. Possessing mutant powers due to her superpowered mother Salamandra, Cole was, after all these years, a girl that Johnny should have been protective of, rather than a girl he developed an adolescent crush over. Even at the very worst stifling of “real time”, Johnny is at least twenty-five at this stage. Not insurmountably older than Cole perhaps, but as a man with a divorce and multiple relationships behind him, to be enticed by a young girl who would only be legally able to consummate a relationship by two years in Johnny’s home state then it’s somewhat unethical, if not immoral. It’s the continuing denigration of Johnny’s characterisation and maturity level – Johnny “eats Cap'n Crunch out of the box” only in Waid’s perception, not in the reality of the comic book up to this point – that ultimately make the later Mark Waid issues fun but hard to digest. It’s not just Johnny that Waid dramatically alters the characterisation of – the Wizard is implied to have never slept with a woman, and used machines to impregnate Salamandra, while the Trapster is fully emasculated and subservient to him. The final problem with the evil FF story was, of course, that they weren’t really about anything. After the almost total reinvention and reimagining of Doctor Doom, we find that in their eleventh appearance the group really have nothing to say. The Wizard becoming net-savvy and having his own virtual chatrooms is a nice touch to the virtual age, and Hydro-Man’s accelerated powers – he can now kill by absorbing moisture from anyone around him – are interesting, but ultimately there’s no real need for yet another rubber match with a group that seem somewhat empty without the Sandman around.The year ended with an inspired albeit unfocussed prelude to a four-part Galactus story: the FF come across a group of aliens out to kill Sue as the only mortal alive that could reveal their location to the world devourer. “Avengers Disassembled” was a much-hyped shake-up of the long-running (created 1963) team, which ended with the deaths of Hawkeye and the Vision. Six of the Marvel titles were used to create exceptionally tenuous linking material with the book and carried the “Disassembled” tagline on their covers, which included issues #517-#519 of The Fantastic Four. In truth, the connection – the FF realise that New York is empty with the Avengers missing – is ethereal in the extreme, and so the issues in question - The Avengers #500 - #503 (***) - don’t really require purchase in order to understand the stories therein. While well-drawn and decently written, there's a very crass, cynical nature to the entire venture, and the entire destruction being the unconscious work of the Scarlet Witch is a little unpalatable. However, of note for the FF is that not only is Agatha Harkness revealed to have been long dead, but replacement member from the final years of the first volume - Scott Lang, the Ant Man - was also one of the casualties of the run. Featuring cameos from the FF themselves, the issues marked the end of the first volume of The Avengers, thereafter continuing as The New Avengers. Lastly, the entire storyline had a "three months later" coda in the self-congratulatory The Avengers: Finale (***) Expectedly, Scott Lang has since been resurrected by a Marvel who no longer see death as a disadvantage to comic book characters.